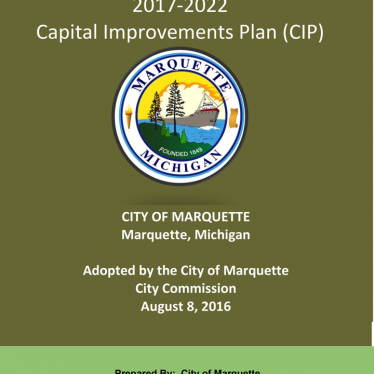 The 2017-2022 City of Marquette Capital Improvement Plan (CIP) will serve as a tool to assist the City of Marquette in turning long-range policy planning into real improvements on the ground. A six-year capital improvement plan and an annual update of that plan is now a requirement for the City under the Michigan Planning Enabling Act of 2008. In addition the City Commission has adopted policy number 2015-03 “City of Marquette Capital Improvements Program” to provide procedures for the development, approval, and publication of the CIP. The following report identifies the major capital improvements needed and/or planned for the community, the timeframe for implementation of those improvements, and the budget and revenue sources that will make those improvements a reality. Capital improvements cover multiple departments within the City, and include City government facilities, water and sewer utilities, fire protection vehicles and equipment, police equipment, parks and recreation facilities, non-motorized pathways, and professional services.